Dr. Donald J. Betar, Jr., graduated from Hollidaysburg Area Senior High School in 1985 and from Juniata College in 1989, with a Bachelors Degree in Biology. In 1993, he received his Doctorate Degree in Dental Medicine from the University of Pittsburgh School of Dental Medicine. He is a member of ADA (American Dental Association), PDA (Pennsylvania Dental Association), AGD (Academy of General Dentistry) and affiliate member of AAPD (American Academy of Pediatric Dentistry). He is certified in Basic Life Support (BLS), Advanced Cardiac Life Support (ACLS) and Pediatric Advanced Life Support (PALS). Dr. Betar has been in private practice for over 17 years. In December of 2006, he moved his practice into a new state-of-the-art facility. Since then he has built an addition to the office to accomodate his growing practice. Finished in June of 2014, the building is one of the premier dental offices located in central Pennsylvania. It is equipped with the most modern, technologically advanced dental equipment available. In December of 2010, Betar Dental continued its commitment to providing the most advanced equipment available by purchasing a Va-Tech PaX-Duo3D Conebeam Digital Radiograph machine. This equipment provides Dr. Betar with 3-Dimensional imaging for the most precise and safe placement of dental implants. Since 2005, Dr. Betar has placed and restored over 500 dental implants successfully. Betar Dental has acquired the service of a Board-Certified Dental Anesthesiologist to provide I.V. general anesthesia to those patients who are fearful of dental procedures or those who require extensive dental therapy. These services are perfomed at the office of Betar Dental & Associates. In December 2008, Dr. Betar was appointed to the, formerly named, Altoona Regional Health System Medical Staff in the Department of Specialized Surgery, Clinical Service of Dentistry (Oral Surgery/General Dentistry). This appointment enables Dr. Betar to provide dental services to children, adults and special needs patients, who require general anesthesia at the UPMC Altoona Health System Outpatient Surgery Center. Dr. Betar has recently obtained his Restricted I Anesthesia Permit, which allows him to provide IV moderate sedation to children thirteen years of age and older and also adults. He has also been able to provide nitrous oxide sedation since receiving his Restricted II Anesthesia Permit in March of 2013. These services are offered in the comfort of our office. 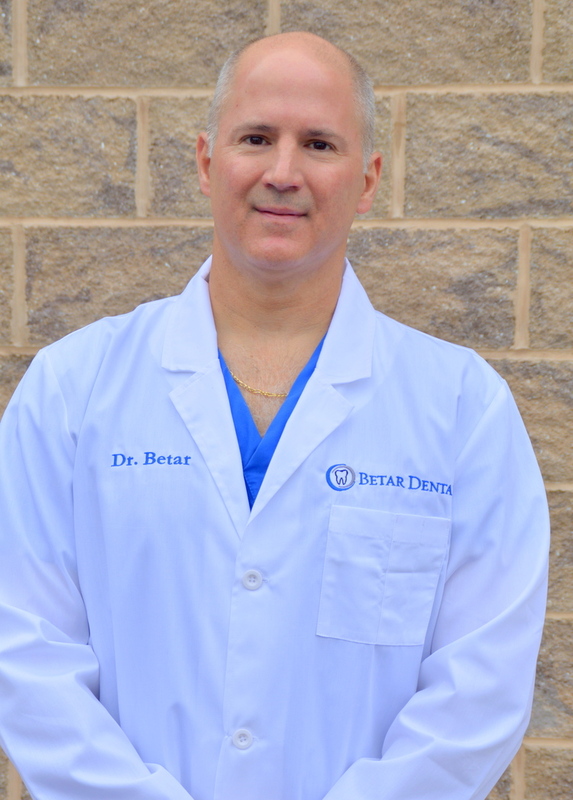 Dr. Betar is an adjunct instructor in dental public health and information management at the University of Pittsburgh School of Dental Medicine. He teaches Pitt dental students through the S. C. O. P. E. Program at the children's dental clinic in Altoona. Dr. Betar's hobbies include ice hockey and fly fishing. He also enjoys spending time with his wife and three daughters.